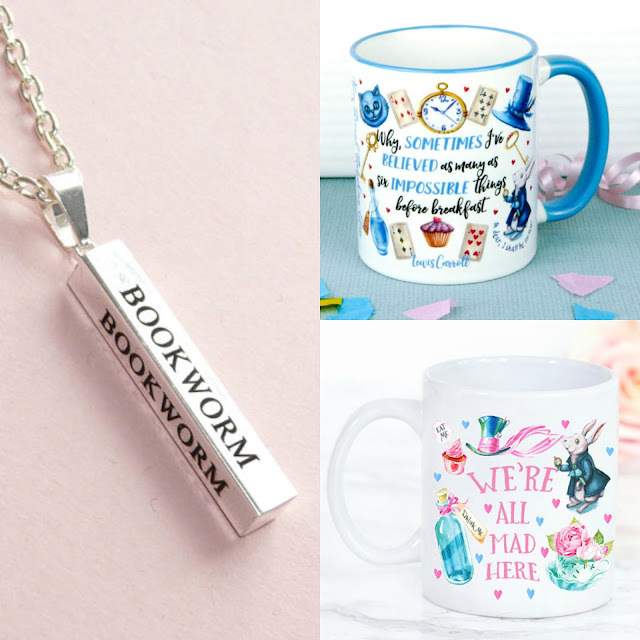 Enter this giveaway for a chance to win two Alice in Wonderland mugs and a Bookworm necklace made by Miss Bohemia. Good luck! Winter. I like diving under a thick blanket with a mug of hot chocolate and a good book. Winter is my favorite season for reading, because I can stay warm inside by the fireplace. My favorite season for reading is summer, because to me, it's the most magical season...everything seems possible in summer. Summer is my favorite season. I love to read by the pool. If I get hot, I take a dip and then get back to my book. Winter. I like reading under a cozy blanket. Flyergal82 at (yahoo /dot -com? I like to read in winter when I can sit by the window with the sunlight bouncing off the snow. I read in all seasons, Christmas is great though because there is loads of time to kick back and read any time of the day. Summer so that I can read outdoors in the sunshine. Any season is my favorite to read, I love reading anytime, all the time! My favorite season for reading would definitely be Winter. I get a lot more time off to do things I enjoy and love to cuddle under my blankets with hot chocolate and a really good book. Winter is my favorite season for reading because I like to snuggle under the covers with a cup of something hot. Summer, because then I can sit comfortably outside on my patio reading. In winter at -25 to - 40 C I have to really wrap up warmly and can't stay out for too long. Summer. I love sitting outside reading. All year long. Summer-Spring I can read under a shade; and on Winter-Fall, inside tucked under a blanket. I like reading in the winter. Nothing better than sitting by the fireplace with a mug of tea or hot chocolate and a good book. Winter, when I can read curled up with a nice hot chocolate. Autumn is pumpkin spice latte time, of course. I love to read under a shady tree in summer. I love to read the most in the winter when its to cold to work in my garden. I love reading in all seasons but winter is my favorite, curling up with a good book! My favorite season for reading is winter. I have RA, and don`t get much else done. Snuggled in my favorite chair, covered with my favorite throw, and a nice hot cup of hot chocolate. Fall time is my favorite time...cuddle up with a cozy throw cup of coffee or hot chocolate and a rocker enjoying a great book!!! Winter so I can snuggle up with a hot chocolate and a good book. Winter i love to cuddle up under a fluffy throw with a yummy white hot chocolate. I love to read under a blanket in the winter! Summer is my favourite season for reading because I love to sunbathe at the same time. Autumn! I just love it when the nights close in, the fire is lit and I can snuggle on the settee and read! Winter because you can curl up under a blanket with a hot chocolate and lose yourself in a book for a few hours, while the wind howls outside. I love reading all year round, so I couldn't choose! Any season, just the location that changes. Summer it's in the garden or on a sun lounger. In winter you can't beat cuddling up in front of the fire or in bed. I like to read at winter, in front of the fireplace, that's so comfortable! Summer, definitely!! The air is lit up and the environment is fresh and cozy! What more do you need than a good book? I read every day. I don't have a favourite season. Autumn. Kids are back at school after a lengthy school holiday and its quiet enough to enjoy reading without the incessant sound of "MUUUUUUUM" ever few minutes! autumn, just cold enough to get snuggy! My favorite season for reading is winter because I like snuggling up as I fall into a good story. Summer, I love to read whilst sunbathing! Spring, it's my quietest time of year so I can get plenty reading done with no interruptions. Winter as I can stay in bed have a cup of tea and read a good book when I keep warm. Winter at home with a hot drink but also love reading on holiday in the shade with a cold drink! All seasons have their magic, but I'd pick Autumn for reading. Blustery leaf blown days and chilly evenings sat by the window with a book is heavenly. cooler weather in the fall makes it tolerable to go outside. winter because people are not always saying why are you not going out door it's nice weather.in the rain they never look at you funny for wanting to stay in and read. I think Autumn as you have an excuse to snuggle up. WINTER: Nothing like snuggling up with a mug of hot chocolate and a good book in front of a roaring fire (well radiator, but that doesn't have the same ring), usually with the dog on the other end of the settee. Winter, the long nights make for amazing reading atmosphere! Winter. Te long dark nights help me get more reading time in by ending me to bed early!